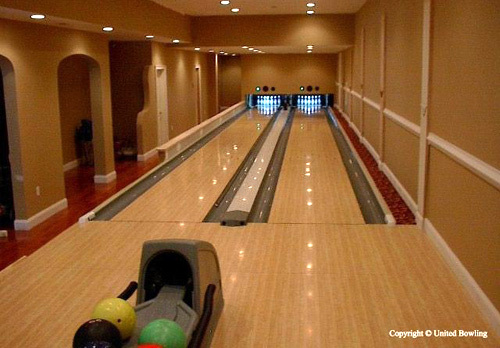 Custom Installed Residential Bowling Alleys | OhGizmo! I’m not thrilled with the idea of owning a house, mostly because of all the added responsibilities like cutting the lawn, shoveling snow and having to be that mean neighbor who always confiscates baseballs and Frisbees that land in my yard. But on the other hand a house allows you to do things like install a dedicated home theater or even cooler, your own bowling alley. 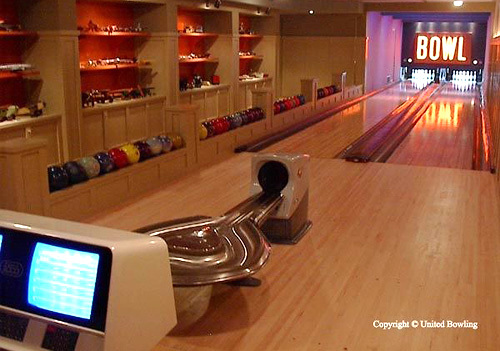 United Bowling, a Florida based company will install a 2 lane, full regulation length bowling alley in your home complete with genuine AMF and Brunswick equipment like pin stackers and ball returns. You’ll need a minimal area that’s 88 feet long, 12 feet wide with a 10 foot ceiling, but if the kids have moved out there’s no reason not to demolish their bedrooms in order to make room for such an awesome upgrade. Of course at $88,000 it’s not a cheap upgrade, but if it was worth it to Daniel Plainview, then it’s worth it to me. I drink your milkshake. Then bash your head in with a bowling pin. I would probably piss in the ball return when I was liquored up. That is a really nice bowling alley. If a homeowner can afford to have on of those put in their house. I doubt they are doing their own laundry and cleaning up around the house. I think an in home bowling alley like that would be an awsome addition to the house. $88000 dollars is a bit stiff. But it really is beautiful. Can you imagine how good your bowling score would get from all the practice you would get in. damn i have always wanted my own bowling alley. dare to dream. I do, and trust me…you don't want to. It's a nightmare dealing with whiny league bowlers that, even when everything is perfect, they still find something to be crabby about. Unfortunately you have to deal with them because they pay your bills…We're selling our place in May. So, are you selling it dismantled? And what's your target price? I love this sport.this place looks nice.